Curving around the western border of Green Lake and Swan Lake rests a crescent shaped treasure of a neighborhood in North Bossier City known as the Lakewood subdivision. Bordered on the northwest by Wemple Road, the woody surrounding areas give way to large grassy lots with willows, magnolias, and crape myrtles. These beautiful, fairly large custom homes were built mostly between the 1990s and the early 2000s. Deep red brick, creamy stucco, rosy brick with peach siding, and a variety of other colors and styles give this charming neighborhood quite its own character. Away from the buzz of central Bossier City by only a few miles, one can enjoy privacy and serenity in this neighborhood but still hop on the road and arrive at your Bossier destination in moments. Schools in closest proximity are W.T. Lewis Elementary, Legacy Elementary, and Stockwell Place Elementary all just South of Lakewood and it falls within the district of Airline High School. You will also find Willis Knighton Bossier Health Center within a few miles at I-220. 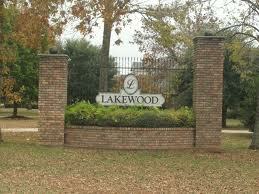 Lakewood embodies an attractive blend of qualities; unique, comfortably sized homes, nearby lakes and wooded areas, yet a convenient in-town location makes this neighborhood inviting for sure.